In the life of every person who has a cottage or a country house in his possession, it has become traditional to make all the structures yourself, in particular if you can save a lot on this business. There are no exceptions and entrance gates. 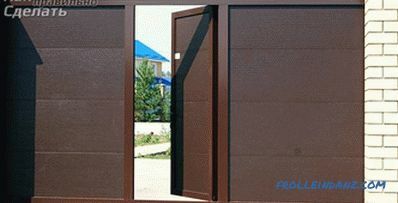 Having sufficient experience in working with metal products, skills in using special equipment and an understanding of the principles of operation, you can easily figure out how to make a sliding gate with your own hands. 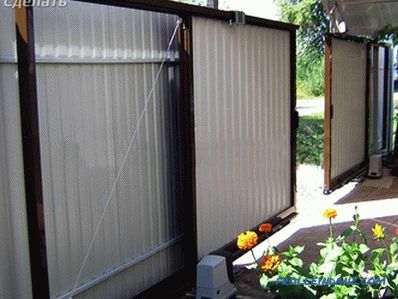 For the improvement of buildings, the use of sliding (retractable) gates is gaining in popularity. 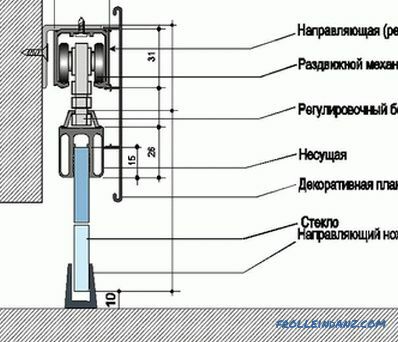 According to the principle of operation, this design is represented by two types: manual and automatic. bulkiness and weight of the structure compared to the swing type. 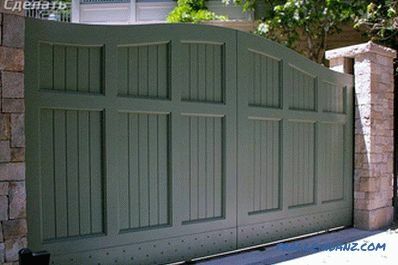 When choosing the type of gate, you should not rush to make a decision before consulting with a professional, in case of confusion. In most cases, restrictions on use can be easily circumvented based on experience and non-standard solutions. 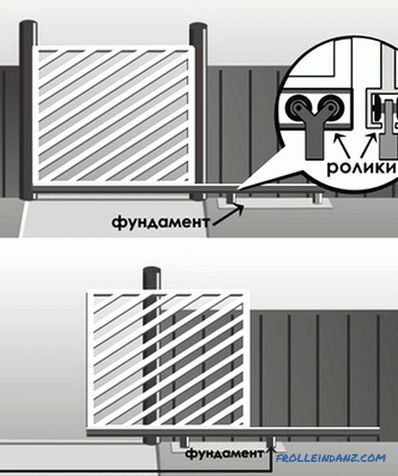 double leaf - relying on two prepared platforms, two doors of the gate are simultaneously moved apart in opposite directions, an upper roller beam is required - an excellent way to evenly distribute the load for heavy structures with a height of over 2 m.
Facing the valves can be made of any material depending on tastes, preferences and financial capabilities of the host. However, the most used raw material is profiled. 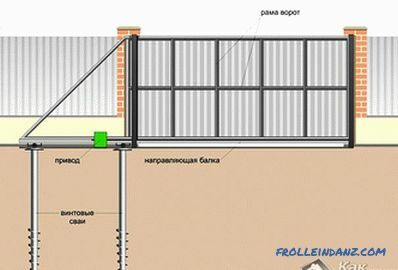 In order to make the sliding gate yourself, you will need to prepare the necessary tools, materials and make an approximate sketch of the future structure. 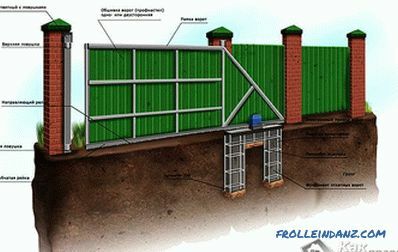 Before carrying out works on the erection of the gate, it will be necessary to establish dimensions and compile accurate drawings. 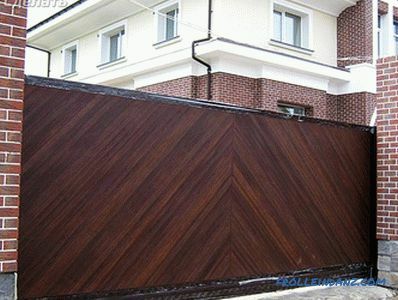 The size of the gate and the choice of the necessary fittings depend on the dimensions of the future construction. The width of the entrance opening should provide free access to vehicles. 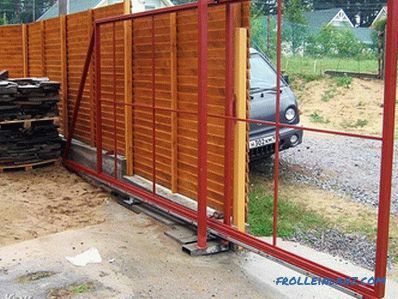 There are often cases when it is necessary to install five-meter gates (along the width) for the entry of passenger cars, since the narrow streets of the summer villages are not always capable of ensuring an optimal turn of the car. 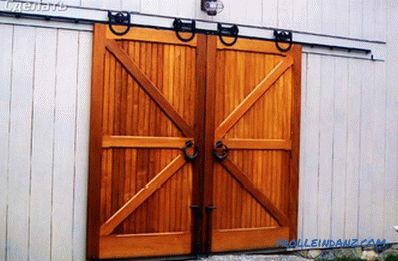 To correctly calculate the required width of the gate, it is useful to pre-mark with pegs prospective arrival and try to call on him into the yard. Depending on the received number, the required distance for rollback of the gate is also calculated. 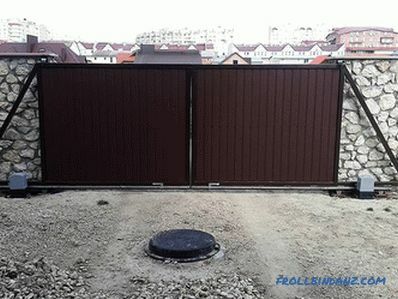 In the case of a sliding gate, the last indicator should be twice the entrance opening (at least a meter to each side). Having finished with the preparatory procedures, we proceed to the installation of the supporting pillars. 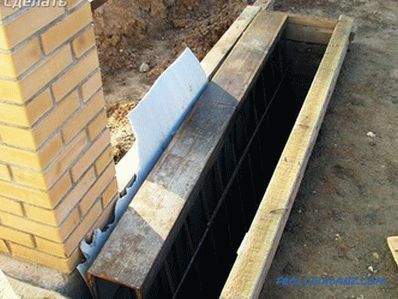 As a basis for these elements of construction, you can choose any available materials, ranging from wooden beams and ending with brick laying. 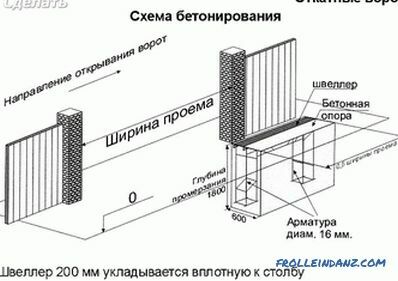 The main condition is that the support should be in the ground at a depth of not less than 1.2 m. Otherwise, the weight of the erected gate can break the vertical, especially during seasonal floats of the ground, which will lead to the deformation of the gate and the rapid failure of components. We dig out two holes with the required depth values ​​and set the supports on the construction level, and then we concrete. The time for the concrete to fully cure is at least 7 days in dry weather. 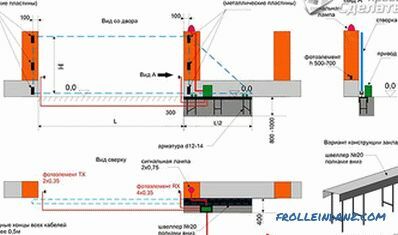 The primary event is the welding of 1-meter bars of the reinforcement to the channel bar. Next, dig a hole 40-50 cm wide, at least 1.2 m deep and a length equal to the length of the portal opening. After that, we install two channel beams "legs" down, check once again on the level and concrete products. The channel must be flush with the asphalt. 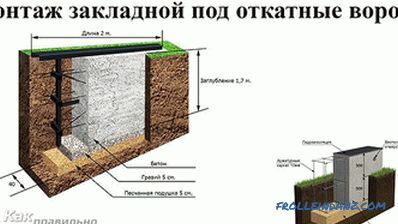 Since the channel with the welded reinforced legs with a trench depth of 1.2 m may not coincide with the upper edge of the soil, it will be useful to pour rubble of a small fraction, for example, 5 * 20, on the bottom of the trench. If everything is done correctly, then the end result should form a level platform made of metal, which we later equip the sliding carts. Exactly the same as when holding the foundation for supports, it is worthwhile to let the foundation stand for at least 1 week. While the drying of the completed concrete foundations takes place, we proceed to making frames. 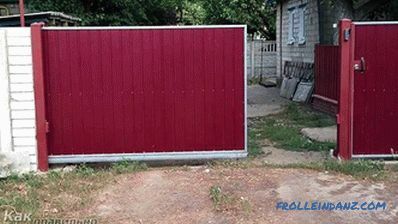 To do this, you will need to assemble two identical frames. 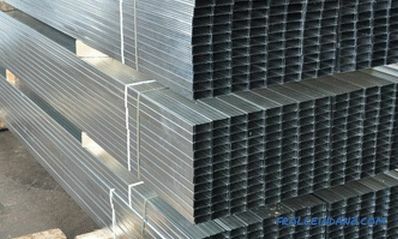 The most used and easy to install material is a profile tube 60 * 40 or 50 * 50 mm. Having defined the dimensions, we cut the required amount of the profile, we clean and degrease the surfaces of the elements. Having finished with the described procedures, we proceed to welding. 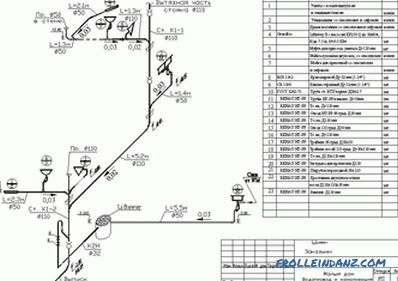 Based on the prepared drawings, we fasten all the prepared pipe segments to each other, forming the outer frame. 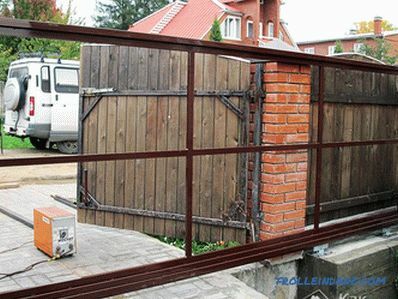 In the course of work, it is necessary to first prepare the material for one of the gates, make a full-fledged frame and subsequently use it as a template for the second half. In addition, when working with metal products, do not forget about the mandatory use of special eye protection and skin protection. 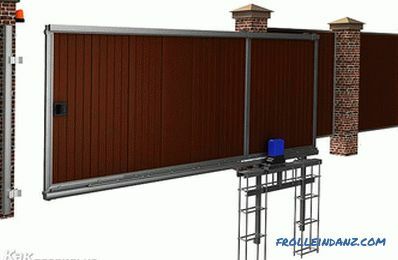 In the resulting construction, we mount an internal frame that is not only will give the necessary rigidity to the gate, but will also become the basis for fixing the facing materials. 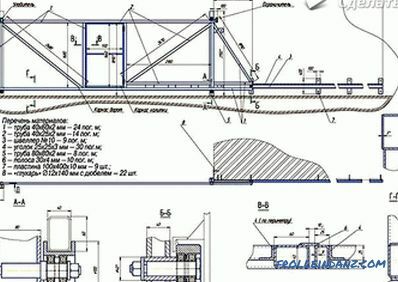 To do this, it is advisable to use the same profile pipes, but with dimensions ranging from 20 * 20 to 20 * 40 mm, which should be precisely pinned to the main frame. Then we weld the guides to the lower beam of each frame. Next, we clean with the help of an angle grinder or grinder of the welding place, clean the cleaned places again. All welding work must be carried out in a staggered manner, otherwise the resulting frame may lead or turn out from overheating. 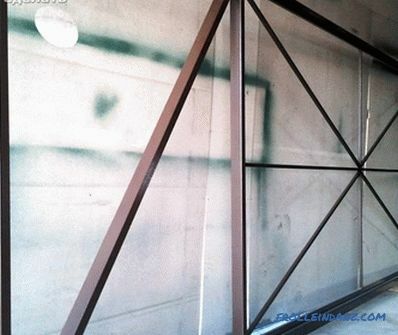 Having made sure that the prepared frames are dry, we proceed to the installation of the facing of the gate. 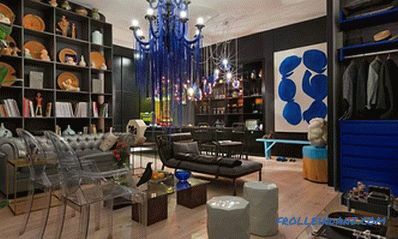 The most used material for these purposes is the professional flooring. Sheets are fastened by screwing in metal screws with a special drill or installing rivets. At each channel, we set up rollers for each sliding gate and move them to the opposite sides as much as possible. Next, we put on them the guide frames and exhibit the construction level. After welding, we point the roller trolleys to the channel beam. Making sure that there are no skews, install the upper retention and end rollers. 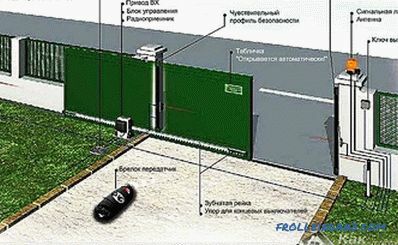 We proceed to check the work of the resulting gate and install small hardware. 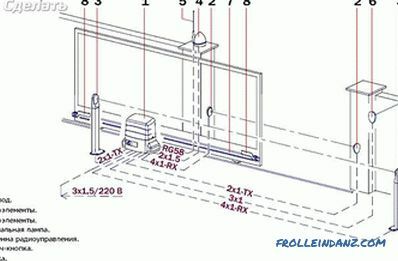 If you are going to install the automation on the erected structure, then after purchasing the kits, carefully read the attached instructions. Exact following of technical documentation without effort will allow to equip gate with the desired equipment. It will be useful to install the top beams or channels on the supporting posts , repeating all the above operations with the lower fasteners. 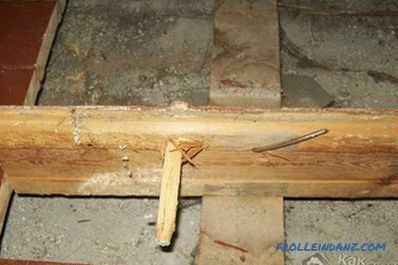 It is more expedient to fix the catchers directly on the door leaves, so that when closing the doors they interlock, eliminating damage and forming a single structure. Making your own design at the cottage or cottage will significantly reduce waste during the construction of the entry element. The installation process is simple, but requires strict adherence to the instructions provided, drawing up a sketch and precise control over the verticality and horizontality of each component. 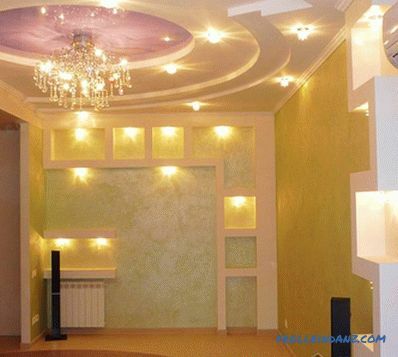 Having compiled and calculated the required amount of material, consult with experts and assess the correctness of the actions taken by experts to be sure of their calculation.